Although we aren't seeing spring weather yet, I was very excited to start barbecue season! 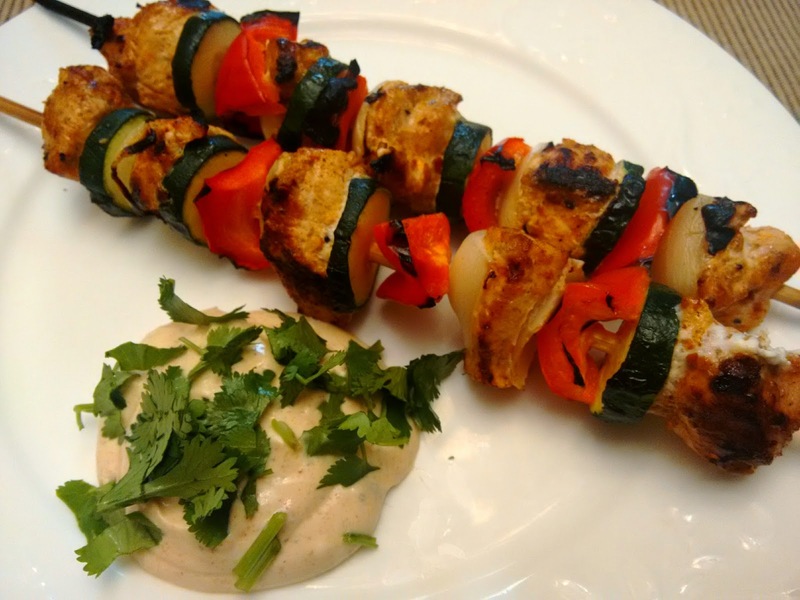 Kebabs are a barbecue staple, so this seemed like the perfect recipe to try. Mix the marinade, and set half of it aside to mix with Greek yogurt to make a flavorful dipping sauce...so good! We used 5 pieces of chicken on each kebab, so three large chicken breasts made 9 kebabs. You could stretch the number of kebabs by adding more veggies, such as cherry tomatoes or mushrooms and one less piece of chicken. Serve kebabs over rice or with a side of corn on the cob. If you are using wooden skewers, be sure to soak them in water for 1 hour before assembling the kebabs to prevent burning. Mix marinade spices, lemon zest, lemon juice, and minced garlic. Toss chicken pieces in half of the marinade and refrigerate for 1 hour. Mix remaining half of marinade with Greek yogurt and refrigerate until serving. Assemble kebabs, alternating between chicken, zucchini, peppers, and onions. Barbecue kebabs until chicken is fully cooked. Serve with Greek yogurt dipping sauce and fresh cilantro.